[ S. R. Crockett, Scottish novelist. ] Typed Letter Signed ('S. R. Crockett'), to a bookseller, thanking him for sending the book 'Idylls of Spain' and expressing an interest in the subject. On letterhead of the Savoy Hotel, Embankment Gardens, London. 30 January 1899. 1p., 12mo. In fair condition, on aged paper. He thanks him for sending 'Idylls of Spain' (by Rowland Thirlmere, 1897), which 'Mr. Milner' will settle with him for, and states that he is 'interested in the subject and would be glad of a note of any books you happen to come across on this subject'. In 1903 Crockett would publish 'The Adventurer in Spain'. Four pages, pp.2, folio, unbound as issued, two leaves of bifolium separated, sl. chipping and sunning of edges, fold mark, text clear and complete. It includes: P.1 & 2 a history of the appeal (committee meetings etc), and its objectives, concluding "David Masson | Chairman | 27th May 1897. "; P. The Committee (Earl of Rosebery, J.M. Barie, Conan Doyle, Henry James, Joseph Bell, Rider Haggard, Thomas Hardy, Edmind Gosse, Rudyard Kipling, Leslie Stephen, etc etc. ; p. "First Subscription List" (much the same as Committee. Autograph Card Signed from the Scottish artist Robert Macaulay Stevenson to his 'brother-artist' David Sassoon of Kirkcudbright. With signed print of a landscape by Stevenson. Dimensions of card 14.5 x 11 cm. Bifolium. Good, on lightly-aged paper. Cloudy print of landscape on recto of second leaf, signed in pencil 'R Macaulay Stevenson'. 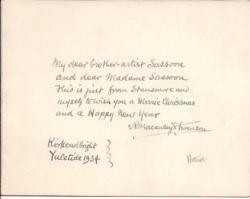 Neat pen inscription on recto of first leaf: 'My dear brother-artist Sassoon and dear Madame Sassoon this is just from Stansmore and myself to wish you a Merrie Christmas and a Happy New Year | [signed] R Macaulay Stevenson | Kirkcudbright | Yuletide 1934'. [Pamphlet produced at the Canterbury College of Art.] The Measure of the Year. Being extracts from The Twelve Moneths by Matthew Stevenson with four decorations by Sheila Stratton. Produced at the Canterbury College of Art, 1949. 12mo, 10 pp. Stitched. 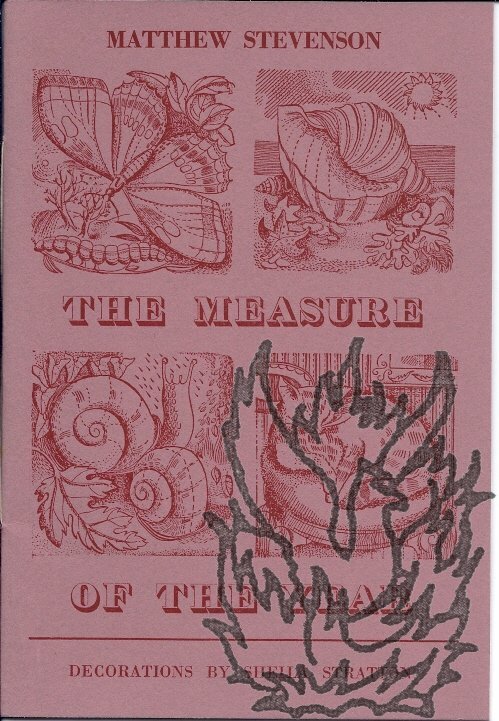 In original red wraps, with title and illustrations printed on the front in red. Good, on lightly-aged paper. 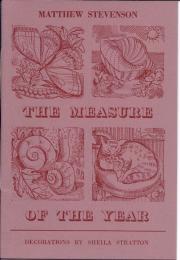 An attractive pamphlet, with the illustrations accompanying sections entitled Summer and Winter. At end: 'The text was set in 12 pt. Bodoni by A. File and A. Morris and the machine work is by D. Jackson and B. Dove'. Scarce: no copy on COPAC.